The train line from New York to Connecticut is testing service: The Internet service would be used to drive passenger access, as well as live information on screens in cars coupled with advertising. For now, the MTA isn't revealing which train is equipped during this trial so as not to disappoint riders. A California train line has onboard Wi-Fi funded: I have been writing about the Capitol Corridor line's efforts to get Internet access installed for five years. I wrote about the first RFP in 2006. The authority that runs the line ran tests with some providers, including EarthLink during that ISP's wireless networking days, but was never able to get the right combination of funds, vendor, and technology. But the dream never died. Service will be installed during 2011. One rider questions the nearly $4m being spent on the service, wondering if it could have been put to better purposes, such as better wheelchair access. That's a good question, but the point of Internet access is to bring more passengers on board. Train service is subsidized, of course, just like roads and airports, but adding passengers increases costs slightly relative to the additional revenue. If Internet service adds tens of thousands of additional trips per year, this can offset its cost. The story misses a secondary point: the $4m is nearly the full capital expense for both passenger access and back-end operational uses, which incur separate costs—or simply don't exist, reducing efficiency or safety—today. The Vancouver, BC to Eugene, Oregon runs gains free Wi-Fi: How do you get people to choose the train over a plane or car? You make it comfortable, fast, reliable, and useful. Amtrak has long advertised the notion of getting work done, and on some of the Cascades run (from Vancouver through Seattle and Portland down to Eugene) you can get a business-class seat with a power outlet. Now, a Wi-Fi plan long in the testing is available and at no cost. Amtrak provides Wi-Fi service on the Northeast Acela run, and many regional train operations also offer Internet access. Over 800,000 passengers rode part or all of the Cascades line during 2010, the high-water mark for ridership. I have a trip planned to Portland in February, and might opt for train over car because of the Wi-Fi. Service is free for now, and may remain free; it depends on usage and other factors. Internet service is typically installed to provide operational service for the train line, as well as passenger access, but it's unclear on whether this is just an amenity. Nomad Digital was signed by Talgo to install and operate Internet service on the high-speed Pacific Northwest Amtrak route: Talgo are high-speed trains (high speed for the United States) that operate between Vancouver, B.C., through Seattle and Portland, down to Eugene, Ore.
Nomad will install a system that aggregates multiple back-end 3G network connections as available, which includes Canadian carriers north of the border. Timing wasn't announced. I wrote about a test of such service back in March 2009. Amtrak has opted to keep Wi-Fi operating and free on its Northeast Corridor Acela trains: A three-month trial has convinced the rail operator to keep the service active and continue to offer it at no charge. Usage is high: 115,000 passengers per month, or 39 percent of riders, of which 76 percent rated the service favorably, the Providence Business News reports. Onboard Wi-Fi for a new 95-mile rail system in New Mexico relies on WiMax for backhaul: The folks at Azulstar, working with INX, built out the service, which will be free to passengers, and available along the route and at 15 train stations. Having driven some of that route (Albuquerque to Santa Fe), I reckon that the flatness of the terrain coupled with some mesas and higher points made the install feasible with just 22 base stations. Azulstar, which I wrote about two years ago for its plan to use a special shared, cheap licensed band to run WiMax services, says it gets 6 Mbps downstream and 4 Mbps upstream. The company's head, Tyler van Houwelingen, told me via email that the system is redundant and mostly wireless. 5 GHz and 18 GHz are used for backhaul combined with some wired connections along the route, and WiMax at 3.65 GHz (that special band) is used with a 900 MHz fallback. Base stations are powered by solar and electrical with a 24-hour battery backup. Given winter and summer conditions in New Mexico, redundancy won't be extraneous. The MTA wants a service provider who would operate a network to bear all the expense of installation and operation (including railroad labor costs for same), provide 24x7 customer support, and uninterrupted service. But the proposal is pretty muddled. While digital advertising (changeable signs on board trains and at stations) should be part of a bidder's thinking to minimize the cost in installing such systems, there's no spec for those systems. A bidder can build a bid partly around offering such services. The MTA also likes bids in which the authority shares in revenue. I don't see how this could fly. No sensible firm would propose taking on all this expense without any assurance of revenue beyond the public Wi-Fi side of the system. Despite the large number of passengers, many of those most likely to pay already have 3G service on smartphones or through laptop cards. There's no operational services component, and that should be the baseline for any new rail RFP of the last five years. It's not so much that 3G service works perfectly along the various part of the system, but it certainly works well enough. A service provider would either need to be a cell operator that can use the system to promote and sell Wi-Fi by itself and a combination of 3G and Wi-Fi (AT&T and T-Mobile notably in this position), or build on another technology that would go well together to feed service to trains and mobile devices (Clearwire's WiMax). The system described would likely cost many tens of millions of dollars to build to the specifications that the MTA is requiring, without any substantial potential to reclaim that as revenue. Amtrak has a request for qualifications to build a system-wide communications platform operational and passenger purposes (link not yet available): The RFQ looks to find vendors who could build a system for giving Wi-Fi to passengers, and running a host of operational data needs for the railroad. The RFQ spells out platform requirements, which include inter-car communication via wireless signals--no wires connecting cars--and dynamically assembly of a network when cars change in a train. The system has to support the ability to use multiple cellular networks, aggregating in additional bandwidth as available (such as "external Wi-Fi and track side wireless networks"). Heterogeneity seems to be the message here: no single-platform/single-technology commitments, and a plan for simple module-swapping 4G migration must be included. The RFQ asks for a number of specifics from vendors who choose to bid. I don't see any schedule information in the document I was provided. The document gives some marvelous numbers: Amtrak carries 66,000 passengers a day; 38 percent travel for business, and 14 percent commute. Atlanta's airport, the busiest in the world, had 222,000 "emplanements" (counting stepping off and on separately) per day in 2009. 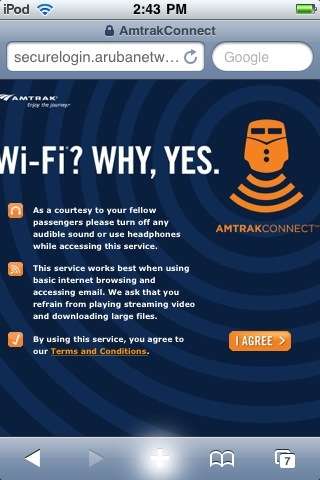 A couple of reports on the new service Amtrak launched in the Northeast: Amtrak's offering free Wi-Fi in six stations and on the Acela line that runs between Boston and D.C.
From the Washington Post, Rob Pegoraro runs through some of the details he's found out. On trains, streaming services are blocked, and some content is filtered, without complete disclosure. There's no excuse for avoiding full disclosure. Pegoraro saw rates of 1 Mbps down and 200 Kbps up from the aggregated mobile broadband service. Nomad Digital's backend is being used, which can take signals from multiple 2G/3G operators to piece together continuous coverage. I imagine the firm uses a virtual network that uses proxies on both ends to allow a continuous IP connection regardless of the intervening network pieces. The user has no awareness of this, and remote sites maintain connections via the proxies. A report from Canada's Globe & Mail indicates that Via Rail's Internet service could use more robustness, where cellular doesn't fully cut it. The firm that operates Via, 21net, only uses cellular connections on the Windsor-to-Quebec City route over which Internet is available. That's what the train operator wants. 21net recommends adding satellite for reliability. Amtrak may wind up using Wi-Fi as yet another tool to bring passengers out of the air and onto the ground. With Wi-Fi at no cost in stations and on trains, the rail operator could use that as a marketing campaign against $7 to $10 per day airport and $5 to 13 per flight airline Internet access, where that's available. Nomad Digital and GBS Group built the service out. Nomad has a many year history of train-Fi. Nomad and competitor Icomera are responsible for most of the train-based Internet access in the world. A few other firms have disappeared during that time or exited the business. Dutch train operator commits to onboard Internet: Nomad Digital will use T-Mobile for backhaul to bring Wi-Fi service to 187 intercity trains initially, with a total of 365 planned. Back in September 2006, when I wrote this Economist article about train-Fi, I had heard strong rumors that the Dutch NS train service was close to committing to roll out service across its entire stock. But it wasn't strong enough to include, and pilot tests didn't pan out. Adding Wi-Fi is expecting to drive $4.3m in additional revenue across the five-year plan. Other lines may also receive Internet access starting in subsequent years and likely in the northeast, with Amtrak budgeting $26.2m for that work. Amtrak would join several regional and national railroads primarily in Europe and North America that offer Wi-Fi on some routes, typically on every train that covers that route. Earlier programs to expand Internet access haven't yet borne fruit, but with an increased interest in commuting without driving in the U.S., onboard Internet access may be a big carrot. The first trains with Internet service appeared at least five years ago, if not longer, and until the last two years efforts were in fits and starts outside of a couple of lines in the UK and Sweden. Now, with robust 3G in many cases paralleling major commuter train routes, adding Internet service becomes less troublesome. The Washington State DOT in conjunction with Amtrak and trainmaker Talgo has been working on adding Internet service to the Seattle to Portland route. Major telecom firms, Cablevision submit bids to cover LIRR, Metro North: The MTA transit authority must be extremely pleased with the initial response to its request for proposals to provide Internet service to the vast number of passengers who ride Metro North and the Long Island Railroad. AT&T, Sprint, Verizon, and Cablevision all responded, among others. Cablevision hopes to have a form of incumbent advantage, having already built Optimum WiFi coverage at 96 percent of the stations in the two railroads' systems for its broadband customers. Its MTA proposal would provide free access to its customers, and charge a fee for railroad services to others. Cablevision would absorb the entire cost of construction, however. Sen. Charles Schumer is pushing the Long Island Railroad (LIRR) to get Internet service on board: Unfortunately, the numbers thrown out ($1,000 per train car) are nothing like the cost unless each train car simply had a cell gateway stapled on top. That cost would exclude installation, maintenance, bandwidth, and network operations. The railroad will issue an RFP later this year. Also, in this Newsday piece and elsewhere, Sen. Schumer seems to think that there are similar and inexpensive systems running all over the U.S. There are now a number of production systems in the U.S. (and elsewhere) on trains, but there isn't anything running on the scale of LIRR. The closest is the MTBA (Massachusetts Bay Transportation Authority), which is either in the process of or finished with a rollout across 13 commuter lines after a successful test on a Worcester line. Other rail-Fi projects are much smaller in scale, often involving (as in Utah and elsewhere) new projects that were designed from the start to have Internet service in stations and on board. In the Bay Area, the BART system has a contractor in place (Wi-Fi Rail) which is ostensibly in the process of setting up systemwide Internet access as we speak. If Wi0Fi Rail is successful as it rolls out in the Bay Area, it's likely that the company's approach will be useful in other metro areas that are otherwise quite expensive to get backhaul and signals through. A call for vendors to propose how to offer Internet access to passengers and an array of operational services is out: The Capitol Corridor Joint Powers Authority (CCJPA), which operates the Capitol Corridor line from Auburn (northeast of the state capital of Sacramento) to San Jose, has issued a request for qualifications for vendors to tell them how Internet service robust enough for railroad security and operational purposes, coupled with free access for passengers, could be built. The vendor with the best plan will move forward to develop a comprehensive bid for both the C.C. line and the Caltrans San Joaquin Intercity Rail service, which runs from Oakland to Bakersfield and Sacramento to Bakersfield. The two lines intersect at Stockton, and run on the same track from there to and from Bakersfield. This would be a fairly massive undertaking, involving 171 miles on the C.C. route and a total of 365 miles on the San Joaquin route. Multiple other firms are involved in train, track, and right-of-way ownership, including Union Pacific, Burlington Northern Santa Fe, and Amtrak. Service would need to be high speed and consistent on trains; stations would need to be equipped as well. The RFQ is agnostic about technology, looking to vendors to provide details about how they might use an array of cellular, WiMax, and other services on a variety of licensed and unlicensed bands, although the proposal requires the use of the 4.9 GHz band for public safety purposes. A single contractor would be preferable, but many sub-contractors could be hired on. Internet access and general services would be provided over Wi-Fi in the trains. A vendor that's chosen will be paid to provide the free Internet service to passengers; that will need to be part of the bid. The vendor could contract this out, and could optionally display advertising to offset some costs. User accounts will be required for access. The goal is to have a single unified network that provides all the operational functions needed for trains, including communications, video surveillance, ticketing, remote telemetry, and public access. The expectation is that backhaul will be pieced together from several kinds of services because the both the routes in question have rural and urban, flat and hilly, and bare and leafy areas. Some cameras will be placed in fixed positions; others will be on trains, some even carried by conductors. Another consideration is that the system must be built with upgrades in mind: better, faster backhaul (like LTE in 700 MHz or other technologies) have to be anticipated so that modules can be added or swapped out without a system redesign. Those with relatively long memories will recall that Capitol Corridor had four vendors lined up to test approaches to Internet service on trains in 2006. That didn't pan out: EarthLink exited the business; another vendor had impractically large equipment; and so on. Three years later, a lot was learned and Caltrans signed on, while there are now several technology contenders in shipping equipment that could work, likely in some combination. It seems like a no-brainer, putting Internet service on commuter and long-distance trains: But there are plenty of difficulties in making this happen. Frequent Seattle-to-Portland Cascade Talgo rider Vaughn Aldredge alerted the Seattlest to his experience, and shared some technical detail with me; that led me to Vickie Sheehan, the Washington State Department of Transportation (WSDOT) spokesperson for rail and marine issues. Sheehan explained that a trial is underway for the high-speed Seattle-to-Portland Amtrak run in which the WSDOT and Talgo, the manufacturer of the fleet trains, are collaborating. Sheehan said the current trial replaces a previous effort in which continuity of service was problem along the approximately 180-mile route. "We don't want to put someting out there that's inferior and would have spotty coverage," she said. The service will likely be free, an amenity to encourage more riders on the line that takes 4 four hours to traverse the route, which can be under 3 by car. Sheehan said that stimulus funds coupled with an effort in the state legislature could provide the money to complete further track upgrades, move to 8 instead of 6 round trips a day, and drop the trip to below 3 hours. Aldredge's experience with the trial was that the service was slow and intermittent, but he said there was no way to be sure another user wasn't engaged in a high-bandwidth activity, like downloading a video. (That's about the first thing everyone does these days when they encounter Wi-Fi in odd locations.) Sheehan said that in generally comment cards were coming back with positive responses. The trial service is backed by a cellular connection, which works reasonably well as the route parallels I-5, the major north/south highway between Seattle and Portland. There have been rumors for five years that Amtrak was considering testing systems on its trains, and there's apparently a public request for proposals out there, but I can't find it, and an Amtrak spokesperson didn't answer the question as to where to find it. Amtrak's fiscal 2009 business plan notes only, "Eticketing and the addition of Wi-Fi technology on trains, on-board point of sale and credit card automation sales are a few important projects planned to either start in FY09 or continue a multi-year effort." One could imagine that with the additional funds allotted to Amtrak nationwide by the Obama Administration, that the train operator might be able to work harder to find private contractors to build a service. Trains are a particular problem for providing Internet access. In some commuter lines, you might have a straight shot along existing rights of way with no tunnels and can simply use existing 3G cellular infrastructure, with an eye to the upcoming 4G rollouts of WiMax and LTE. That's a good 5-year plan, right? But for Amtrak, there are now high-speed trains on certain routes for which standard cell technology might not be appropriate (Cascades with Talgo in the Northwest, Acela Express in the Northeast); extremely complicated terrain with tunnels, mountains obstructions, and so forth; and a varied ridership that might not provide the consistent revenue needed. A combination of satellite and cellular could work, except that getting satellite line of site to, say, Ku-band (way down in geostationary orbit over the equator) could be just as difficult as reaching a cell tower. Likely, some combination of relay towers in difficult spots and varied backhaul would be needed to ensure consistent access. Tests a few years ago on the Capitol Corridor line down in California that runs from around Sacramento to the south bay produced decidedly mixed results. Of four finalists who were supposed to test networks, not much got off the ground (as it were), and the tests produced no conclusive results. Amtrak and the CCJPA (CC Joint Powers Authority) have a shared interest in the CC line, and more work is absolutely planned there. Finally, as with a lot of Wi-Fi being installed now in the air, across cities, and elsewhere, the combination of operational utility (remote surveillance, homeland security, communications, logistics, remote train operation, and telemetry) with public access often makes the budget work were a little bit of back office combined with a little passenger use doesn't sell the offering. A few news outlets picked up a statement from NewYorkology last week that implied Amtrak was looking into on-board Internet service: But when you read the statement, it's not quite what some sites are making it out to be. "Amtrak continues to explore options which will ultimately allow us to offer Wi-Fi service to our passengers," is what Cliff Cole of Amtrak reportedly said via email. Given that the organization still claims to be offering Wi-Fi in several northeast corridor stations, even though correspondent Klaus Ernst has seemingly confirmed that the service is gone (and T-Mobile never gave me an official statement on the matter), it's hard to know what that means. There are now several functioning Internet-on-rails systems around the world, so there should be many more choices to pull from, especially on the most popular northeast Amtrak routes. It's also possible that the organization could use a relatively small amount of funding to create a trial or two, and test customer willingness to pay. Amtrak saw a large uptick in ridership, as did most public transit systems, during the similar uptick in gas and oil prices. With people out of work, it's likely that trains will be used even more if competitive with the costs of driving. Trains still have a unique advantage in most U.S. cities that have service in providing stations right in the middle of towns; airports, you have both the security theater delays and the process of estimating 90 to 120 minutes to get somewhere that's 30 minutes away to give yourself 30 to 120 minutes before a flight leaves. Wi-Fi Rail says they're starting work on putting the Internet into the BART system: After many months of contract drafting or other bureaucratic hinkiness, Wi-Fi Rail has a signed contract with the Bay Area Rapid Transportation system operators. BART covers a huge hunk of the San Francisco Bay Area, out into suburbs and even former exurbs. Update: The San Francisco Chronicle adds a few details. The contract is for 20 years. The first rollout of the project will cover San Francisco and Oakland stations, and the trans-bay tunnel that connects SF and Oakland. BART comprises 104 miles of track and 43 stations, all of which would be covered. The company uses a kind of leaky coax, a method of turning a stretch of wire into an antenna, to provide continuous high-speed coverage in tunnels, which is a neat trick. They claim the consistent ability to reach 15 Mbps upstream and downstream. The system will be fee-based: $6 for two hours, $9 per day, or $30 per month. Don't expect to buy a Boingo or iPass plan and get unlimited BART roaming, too, from what Wi-Fi Rail has previously said. 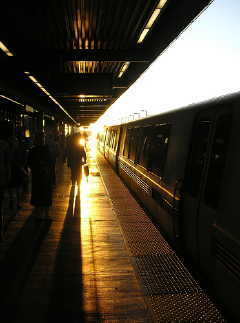 The Chronicle reported that Wi-Fi Rail will offer chunks of 3 1/2 minutes of free service followed by 30 seconds of ads. With the huge growth in Wi-Fi–enabled handhelds (phones, gaming devices, and music players), Wi-Fi Rail expects that its high-bandwidth offering will have many takers. Only two potential customers for the service were quoted in the Chronicle's article. Thomas Hawk, a well-known photographer who works for Zooomr, makes the rather insane statement that having systemwide Wi-Fi that he'd have to pay for isn't worthwhile. For a photographer, I'd think a reasonably priced 15 Mbps upstream connection would be crazily useful. But that's just me. I have 768 Kbps upstream at home (3 Mbps down), and would die for 2 or 3 Mbps upstream, even. At $9 per day, of course, that's too much. But the Chronicle should have found a few business commuters, for whom an extra 60 to 90 minutes of work per day en route (instead of at home or at the office) would make a difference. Parsons at one point seemed determine to be involved in every major transportation-based Internet access system; no longer: The multinational firm has completed the transfer of its operation of the VIA Rail Internet service, distributed to passengers over Wi-Fi, to 21Net. 21Net has been involved in setting up European rail access, including for Renfe (Spain), SNCF (France), and Thalys (cross borders). Parsons late last year spun off its co-owned Opti-Fi airport division to Boingo Wireless, and then its Washington State Ferry operations to Boingo as well. Boingo is now, by far, the largest operator of airline Internet (and cellular) service in the world--you can measure that by airports, passenger volumes, or guessed-at session counts. The VIA Rail offering has been in place for several years, moving to a higher-speed offering a couple of years ago under Parsons banner. The service operates only on the line between Windsor and Quebec City. SNCF in France says they'll install Internet service on their entire TGV Est fleet by 2010: We've seen this promise before, so excuse me if I'm a wee bit dubious about the French train operator SNCF's claim that the service will span all their equipment. Despite Internet access over Wi-Fi being available on several train lines in Europe, including multiple lines in the UK, the biggest announcements always seem to fizzle out. The Dutch train operator was supposed to unwire their fleet a couple years ago and backed away, for instance. SNCF says they'll have for-fee service in 1st and 2nd class areas of TGV Est trains (about 50 of them) by third quarter 2009 in some trains, and full coverage in 2010. These high-speed trains cross borders in all directions. A free portal will be available for information and entertainment access within a train. Fees for access might cost €5 to €10, which is outrageously high, unless you compare it to the very high costs of Wi-Fi across Europe, where you can pay US$30 or more for 24 hours access in some hotels.